Did you know that I love tacos? I do. I really liked them as a kid but back then there were only 2 varieties in my life. Taco Bell and the ones my mom would make. Now tacos are more of a loose concept that I enjoy seeing infinite solutions to. Tacos! Honestly, I’m a much bigger fan of pasta and spaghetti! … You know. Chris is right. 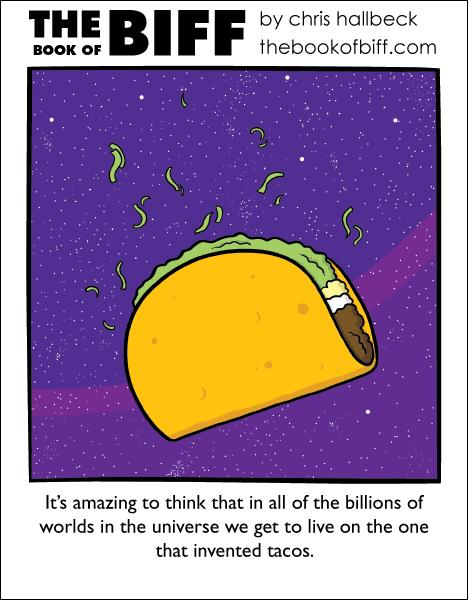 Im glad I live on the planet that invented tacos. And pizza. And Chicken. You know, theres alot to be thankful for on this planet now. The sandwich shop in my town makes taco hoagies; hoagies with taco ingredients (including crunched-up tortilla chips). You ever try Indian/Navajo tacos?